Chemcare aims to avoid unnecessary cost to you. We'll make the process as transparent as possible and keep you informed. James is one of our talented asbestos supervisors with his asbestos Class A and B certification. With five and a half years experience, he has a great understanding of how things should work, how to run jobs and to be as efficient as possible. Along with this experience, he has qualifications in industrial rope access, EWP, first aid, and Site Safe. His experience as a supervisor has seen him run big crews at four to five sites at a time. There have been a lot of big and difficult jobs he’s worked on, but always leaves it in a healthy condition. He claims it’s the people you work with which makes the job worth it. Michael joins Chemcare with over two decades of professional experience across broad disciplines. Michael has strong international credentials gained in complex organisations spanning across 4 continents, with a sound understanding of the nature and challenges facing decontamination organisations in today's economic climate. Michaels ability to support innovative thinking and change within Chemcare will suit our strong work ethic and commitment to our clients. Ma comes to Chemcare with 8 years experience of professional cleaning. She was attracted to Chemcare when she found that a company could provide specialist services that help people back into their homes. And the chance to work in a great team is a hard opportunity to miss. Now with Chemcare she has been trained in Chemical handling, first aid, asbestos class B, and asbestos awareness. She is very aware of the Health and Safety risks that come with decontamination jobs, but is trained with all the right PPE to get the job done. Though the process is always the same, she never finds two days the same. 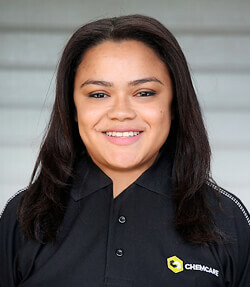 Cristina joins Chemcare with a wealth of experience in customer service specific to decontamination and restoration sector. Having served more than four years in this specialised service, she has gained an extensive appreciation for the health and wellbeing of all customers. Cristina’s commitment and focus throughout the decontamination process will always be driven by the customers best interests. She is proud to be associated with a company that emphasises and supports the need for an environmentally friendly decontamination process.